The 8th World Orchestra Festival will be held in Vienna, Austria from August 1st to 4th, 2019. Under the motto "One Future, Our Better Future", the World Orchestra Festival aims to provide a platform for all kinds of orchestras and musicians to perform, to learn, to compete, to communicate, to establish and deepen friendships. 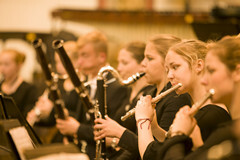 The festival provides a world-class stage for the young musicians to present themselves. The Haydn Hall in the Esterházy Palace, Liszt Cultural Center Music Hall, Concert hall of Vienna Boys' Choir, and the famous Golden Hall of Musikverein, are perfect places for the young musicians to train, to present and to unfold their talents. The Festival's highlights will include Opening Ceremony in front of the City Hall of Vienna, Workshops at the University of Music and Performing Arts in Vienna and the Music Guards of The Austrian Armed Forces, Competition at MuTh - the Vienna Boys Choir Concert Hall, Music Dinner and Party, and Gala Concert at the famous Golden Hall. For the participating orchestras, professors of University of Music and Performing Arts in Vienna, members of the world famous orchestra, The Vienna Philharmonic Orchestra and other renowned musicians and educators will hold workshops/master classes which give the young musician a good chance to get in touch with the world top music educators and learn advanced method and superb performance skills which will build a solid base for their future development. 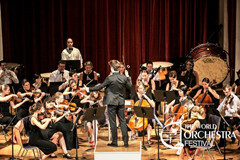 Even competition is not the ultimate goal of the festival, but to encourage further development of the orchestras and their members, the festival provides an open and fair chance for orchestras, by their own style, to present themselves in a way of competition. The jury consists of Prof. Helmut Zehetner, members of the Vienna Philharmonic Orchestra, renowned Austrian musicians and music educators. It is said that one can smell the music notes even in the air of Vienna. Now let's breathe the music in Vienna, be inspired by the culture and tradition of Austria, and let's make a contribution to the world peace and our future! The 8th World Orchestra Festival welcomes you!